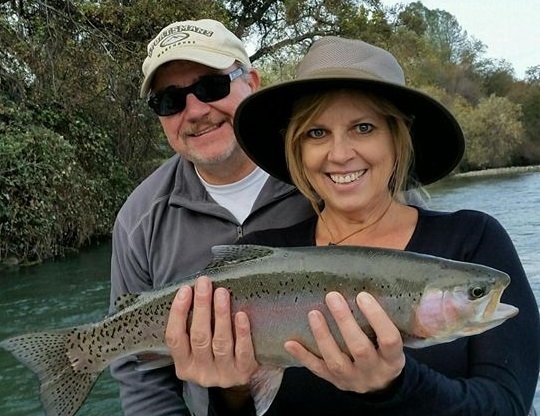 This hearty 24 inch rainbow was caught on Tuesday November 8 with guide Nathaniel Kyncy of Kyncy's Guide Service of Redding by Debbie Peterson of Cottonwood, with Len Lewis looking on. Many guides and anglers are finding the catch rates slow in the Redding area for Sacramento River Rainbows. Some are blaming the lack of salmon in the river, as this is the time when the egg bite is usually epic and 20 to 30 fish days can be common. Still some fly anglers are picking up trout on egg patterns and beads as some trout are keying on those few salmon in the river.. Anglers are also scoring some trout on tan or cinnamon pupas as there are some caddis still coming off the water. This does not mean that there are not trout to be caught as the trout density in this stretch of river has few peers anywhere in the country. And there are plenty of guides who ply these waters daily. The key to success is to maximize on the opportunities, set the hook on any indicator twitch or take down even if it does not feel fishy. 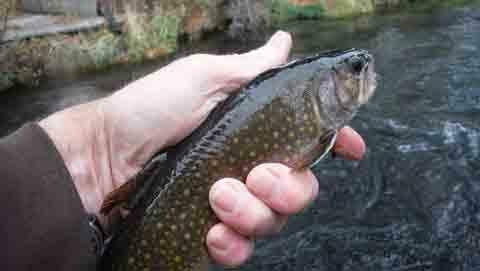 Sometimes it is tough to tell the difference between the fly dragging on a rock or the subtle take of some trout. Look for the bite to explode at any time as water conditions are prime.